The plight of some asylum seekers and refugees children has again been highlighted by the national media over the last few weeks, as plans are being made for the closure of "The Jungle" refugee camp which had housed an estimated 7000 individuals who are seeking asylum fleeing their home countries (Guardian, 2016). Over the last year in particular I have been following the news regarding the plight of some of the most vulnerable members of these communities - the children (Both those classed as asylum seekers and migrant children), and the battle between companies and the UK Government on how best to protect the children of these camps particularly those who were unaccompanied. However even after the UK government agreed to assist there was limited action (Guardian, 2016). 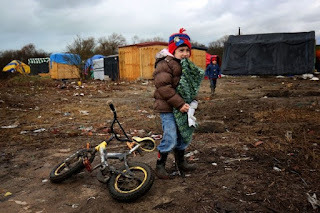 This clearly resulted in this weeks rush action on supporting the refuge of unaccompanied Child refugees by both the UK and French governments in the days before the Calais camp closure. After further reading of the BBC and Guardian articles this week on the number of young people arriving in the UK who are seeking the legal right to come to the UK as they already have family here or as seeking as they gain asylum in the UK the Dubs Amendment, I felt that a further observation on the occupational impact of the situation on the lives of children and young people, who after all, did not choose to be refugees/asylum seekers. The World Health Organisation in 2016 estimated that there are over 60 million people worldwide who are forced to flea their homes. As conflicts continue to increase so do the number of asylum seekers and refugees. Currently there are more than 15 million recognised refugees worldwide (80% of those hosted in developing countries). The Red Cross in 2016 estimated that 126,000 refugees live in the UK, a total making up just 0.19% of the total population. However this does not take into account the number of individuals and families in the UK waiting to hear the outcome of their asylum applications, which the UK government statistics (2016) have reported continue to increase year on year with a 38% increase in the year ending March 2016 (Gov, 2016), this included applications from 3,043 unaccompanied asylum seeker children in 2015, an increase of 56% from 1,945 in 2014. Many of the recognised refugees in the UK have been resettled through government resettlement schemes for example under the Syrian Vulnerable Persons resettlement scheme, which currently grants 87% of applications for asylum under humanitarian protection. Considering Syria alone the UK government has pledged to resettle 20,000 individuals in the UK by 2020 with Scotland taking a third of overall arrivals to date (Guardian, 2016). It was also announced in April 2016 that the UK government with the support of UNHCR (The UN Refugee Agency) plan to resettle 3,000 vulnerable children and their families over the next 5 years. So it is clear that the number of refugee young people within the UK will continue to increase in the coming years. 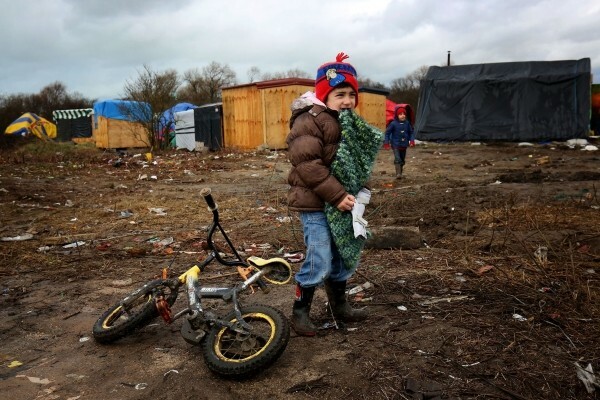 If we look at the last few week alone we can see that the number of children and young people arriving in the UK from Calais has shown the number has increased (Guardian, 2016; BBC, 2016) and these children need to be supported in the transition to UK life. What is the impact on some of the occupational needs of individuals? Considering migration (the movement by people from one place to another with the intentions of settling temporarily or permanently in the new location) in itself as a life event has been noted by Gupta (2013) to disturb a persons established occupations and challenges their identify and sense of competence as well as their health and wellbeing. It is important to note that generally migrants moving perhaps to better economic climates or other environmental reasons, have control over their move and in some form or another prepare for the transition for example by learning the new language (Red Cross, 2016). But then when we consider forced migration (so through seeking asylum and refugee status in a new country and can not return to their home country due to war, fear of persecution or torture), this control and preparation is lost with many refugees and asylum seekers experiencing enhanced occupational disruption and loss through the transition and journey to a new country (Polatajko et al, 2013). This abrupt occupational transition may impact on individuals desire to engage in their chosen occupations due to trauma experienced along side limited resources and preparation (WFOT, 2012). For refugees and asylum seekers who have undergone forced migration often with little notice and without many of their possessions will have their occupations disrupted due to the journey to seek asylum away from their home country, which Whiteford (2000) would highlight as a course for occupational deprivation. 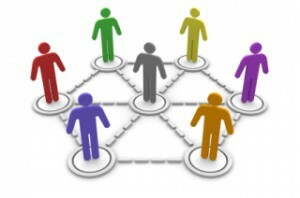 Occupational deprivation being a state in which a person or group of people are unable to do what is necessary and meaningful to them due to external restrictions. For refugees and asylum seekers this process adds increased feelings of helplessness as due to their status and often having limited input their decisions about their future for example where they will live or means of financial support. This is known to be enhances by the restrictions on gaining paid employment whilst awaiting asylum decisions. The disruption and restrictions to individuals occupations can continue after their reach the UK and indeed Scotland with Simich et al (2005) research and Whiteford (2005) case study research highlighting language barriers and unfamiliarity with the new environment and culture alongside inadequate social support leading to individuals becoming social isolated and excluding them from engaging in meaningful occupations. These aspects coupled with external barriers such as poverty, discrimination and inaccessible services further impede on the reintegration and recovery of important occupations and on the general resettlement of refugees and asylum seekers once in Scotland. It is also crucial to acknowledge the data by the world health organisation in 2016 reports over half of the worlds refugee population experience some form of mental illness ranging from depression to PTSD. This could be primarly due to trauma in some form both prior to seeking asylum such as torture and abuse in their country of origin or during the journey to seek asylum itself as it has been heavily documented in the media that increasingly individuals are using precarious and over populated modes of transport (BBC, 2016; Refugee Council, 2016). Mortensen & Kustrup 2006 highlight in their longitudinal study that this can have a long term impact on mental health and wellbeing if not addressed in a timely manner. As refuges attempt to settle into a new community they can continue to experience loss of roles, identity and belonging highlighted by Lipson 1993 and Maroney et al, 2014. This is emphasised within Stryk van Meyel et al, 2011 qualitative research within refugee communities, where loss of identity impacted on individuals quality of life with many also experiencing fear of discrimination and be labelled negatively due to their religion or ethnicity as a barrier for engaging in their new community. This confirmed earlier research by Murray et al, 2001 and Heplinston et al 2004. Research by Brymer et al (2008) and Copley et al (2011) has concluded children and young people seeking asylum experience the similar trauma to adults going through the asylum process but also have the additional developmental challenges impacting on their identity and belonging as their UK based peers for the stage in their lifespan development (Bee and Boyd, 2006). It can also be noted by Rousseau and Guzdar (2008) that between 50-90% of refugee children will experience symptoms of PTSD which can manifest as conduct disorder and social withdrawal. This can create additional social isolation for young people in turn reducing their willingness to engage in productivity, leisure and self-care occupations (Driver & Belran 1998) Social Policy would argue that children and young people are less of a priority when considering integration activities as they will have some experience of integration through their educational experiences by attending local schools or college when they arrive in Scotland. However research by Candappa & Ahmad (2007) and Gateley (2015). reports that language barriers still an issue in the development of social support and relationships within the educational settings for young people. It is also noted by Sporton and Valentine (2007) and Burchett & Matheson (2010) that young people transitioning into a new context can easily loose there cultural heritage and sense of identity due to lack of opportunities to engage in culturally relevant activities. As Occupational therapists we are well placed to understand the impacts of occupational opportunities on the identity of young people (Watson, 2006, Wilcock, 2006, Ting-Tommey, 2012) and seek to provide opportunities that allow them to engage in these within a new context. Why is social support and connection of high importance to refugee and asylum seeker populations? Social support and consecutiveness has been shown to benefit overall health and wellbeing of recently resettled refugees (Burchett & Mathesion 2010). This supports earlier longitualy research by Lie in 2002 which highlighted that social support was one of the main factors impacting on successful resettlement. This was again supported by Simch et al (2003)’s qualitative research study which highlighted refugee’s would be more willing to seek out new communities to settle in post the initial resettlement process as a way to gain the desired support from individuals of similar cultural heritage. A more recent study by Carlsson et al (2006) highlighted that the experiences of individuals post resettlement continued to impact on health and wellbeing with refugees who had access to social support and relationships as well as assess to meaningful occupations increasing individual’s quality of life. It therefore highlights the potential Occupational therapists can play in improving the quality of life of asylum seekers and refugees by creating an environment to both support social connectivity whilst encouraging engagement in meaningful occupations (both through reestablishing and providing means to engage in new occupations) that will in turn promote health and wellbeing within the population (Mitchell, 2009; Simch et al, 2005, Smith 2016). It has also been recorded in Akinsulure-Smith et al (2013) and Coley et al (2011) that social interaction among young people within group settings have both increased their sense of identity and also improved their behavior within other aspects of their life for example their educational provision. The WFOT (2012) statement on human displacement highlights the skills OTs have are well placed to provide this provision due to our skills in activity analysis, grading and adapting the activities to allow for increased access and engagement by the young people. It is also an opportunity for occupational therapists to use our group work skills to enable appropriate opportunities for the young people to adapt and adjust to a new environment and empowering them to take control of their opportunities to work together by adjusting and grading the task and environment to increase their skills. These skills and our ability to view the individual in a holistic way focusing on their physical emotional and environment enable us to understand and embrace the complex nature of individuals who have undergone occupational deprivation over a range of life domains as they adjust to a new environment and culture whilst continuing to embrace their own identity and sense of being. 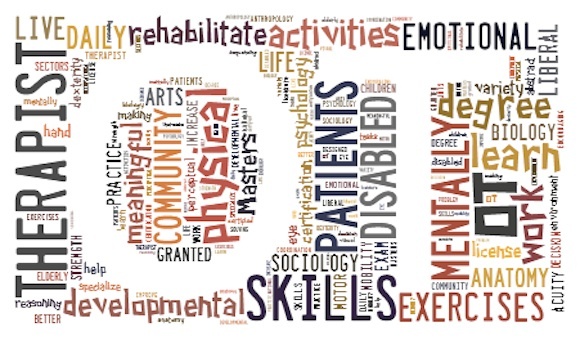 As occupational therapists we believe that humans are occupational beings who have an inbuilt need to participate in occupations that are meaningful to them. The occupational engagement is key to maintaining an individuals health and wellbeing. The government’s drive towards well-being, health promotion, reducing inequalities, sustainability, integrated services, and community care, means there is an increasing need for OT’s to move away from medically orientated institutions towards community based, independent and voluntary services that focus on health promotion, well-being as well as function (Withers and Shann 2008, Molineux and Baptiste 2011) as a preventative and client centered provision. This is supported by the World Federation of Occupational Therapists (2014) position statement on Human displacement, which highlighted the crucial role OTs can play in reducing the impact if human displacement on individual refugees and asylum seekers by working in partnership with community and national partners to protect occupational roles and opportunities of cultural value as well as providing opportunities for individuals to engage in new occupations within their new context helping to bridge the transition. Is it supported by Policy? The UK has an obligation to protect refugees and those seeking asylum, under UN 1951 Refugee Convention and the UN Convention against Torture which should remain unaffected by membership in the EU). Immigration within the UK is a reserved issue under Section 5 of the Scotland Act 1998 (UK Government, 1998; Scottish Government, 1998). This means the UK government take responsibility for Immigration, Migration and Asylum matters The UK Home Office has a statutory duty under the arrangements of the Immigration Act 1999 to support asylum seekers assessed as destitute financially and with accommodation whilst they await their asylum decision. For this to be done effectively the UK government disperses asylum seekers around the United Kingdom to reduce pressure on particular local authorities. Scotland does have joint working arrangements with the UK government regarding the location of dispersal for asylum seekers sent to Scotland under the Immigration and Asylum Act 1999. Scotland does however have devolved control over social policy relating to integration of individuals seeking asylum and refugees living in Scotland, covering areas such as education, health, as well as interpretation and translation. This has meant that the social policy and strategy within Scotland is in contrast to the UK government and approaches integration into Scottish community and culture begins the day an individual arrives to seek asylum as appose to the approach of integration when refugee status is confirmed by English government (Scottish Government, 2013). Historically support has been based within one local authority – Glasgow as this was previously the only registered local authority to accept asylum seekers through the distribution scheme (Scottish Government, 2013) however this has begun to change with successive Holyrood parliaments have moved forward with national accommodation contracts for provision meaning that 25 out of Scotland’s 32 local authorities are now in a position to support increasing numbers of asylum seekers (BBC, 2016). Mulvey (2013) research based Refugee integration Report highlighted that women and children were waiting longer than men for their asylum decisions to be made and this impacted on their health in wellbeing as they were more likely to feel a sense of hopelessness when waiting and this was noted to increase their social isolation within Scotland. The Scottish government 20:20 vision of Achieving sustainable quality in Scotland’s healthcare support a move towards prevention, anticipation and reduction in health inequalities (which asylum seeker and refugee health is highlighted) recognising health and wellbeing and participation and engagement in community life going hand in hand. The Scottish Government has matched this strategy with the New Scots Integrating refugees into Scotland’s communities strategy which encompasses the Ager and Strang’s (2008) integration framework highlighting priorities in providing healthcare that meets the needs of asylum seeker and their communities to enhance integration as well as focussing on a more client centred service for the refugees in their own communities. This report also highlighted priorities focusing on community engagement and social connections which will impact on quality of live and health and wellbeing of refugees and asylum seekers in Scotland. Such as refugees being enabled to build social relationships and are involved in their local communities. It is also highlighted that refugees should be enabled to engage in cultural activities both their tradition and in Scottish culture reflecting the diversity of Scotland’s population. Finally the strategy also emphasises the need for communities across Scotland gaining a better understanding of refugees and asylum seekers in their communities. Funding availability for community and voluntary groups supports this strategy so that a broad range of services are created meet a balanced range of activities for refugees and asylum seekers to engage in. This is supported by The UN Refugee Agency (2016) guidance which state that the key to this process of resettlement is recognising that refugees should be provided with the means of building new lives including ways of directing thoughts and activities into constructive channels. Clearly, this is only the tip of the iceberg and as Occupational Therapy is a diverse in holistic profession, there is scope far beyond the realms of supporting social connection and integration for young people and children going through the resettlement process. It is for individual Occupational Therapists with the support of our professional bodies to continue to advocate for vulnerable groups within our societies to aid occupational justice and participation, since we understand how crucial occupation is to the quality of life and health & wellbeing of individuals and groups within out communities. Adrian, A. (2013) 'An exploration of Lutheran music-making among US immigrant and refugee populations', Journal of Occupational Science, 20 (2), pp.160-172. Ager, A. & Strang, A. (2008) 'Understanding integration: A conceptual framework', Journal of Refugee Studies, 21 (2), pp.166-191. Akinsulure-Smith, A.M. (2012) 'Using group work to rebuild family and community ties among displaced African men', The Journal for Specialists in Group Work, 37 (2), pp.95-112. BBC. (2016) European migrant crisis: Weekly boat rescues reach 13,000. Available at: http://www.bbc.co.uk/news/world-europe-36407338 (Accessed: 01/07/2016). Boyd, D.R., Bee, H.L. & Johnson, P.A. (2006) Lifespan development. Pearson/A and B.
Brymer, M.J., Steinberg, A.M., Sornborger, J., Layne, C.M. & Pynoos, R.S. (2008) 'Acute interventions for refugee children and families', Child and Adolescent Psychiatric Clinics of North America, 17 (3), pp.625-640. Burchett, N. & Matheson, R. (2010) 'The need for belonging: The impact of restrictions on working on the well‐being of an asylum seeker', Journal of Occupational Science, 17 (2), pp.85-91. Carlsson, J.M., Olsen, D.R., Mortensen, E.L. & Kastrup, M. (2006) 'Mental health and health-related quality of life: a 10-year follow-up of tortured refugees', The Journal of Nervous and Mental Disease, 194 (10), pp.725-731. Copley, J., Turpin, M., Gordon, S. & McLaren, C. (2011) 'Development and evaluation of an occupational therapy program for refugee high school students', Australian Occupational Therapy Journal, 58 (4), pp.310-316. Craik, C. (2015) 'Recognising occupational therapy in prevention and early intervention', British Journal of Occupational Therapy, 78 (10), pp.591-592. Fazel, M. & Stein, A. (2002) 'The mental health of refugee children', Archives of Disease in Childhood, 87 (5), pp.366-370. Guardian. (2016) Scotland welcomes third of uk syrian refugees resettlement. Available at: https://www.theguardian.com/world/2016/may/27/scotland-welcomes-third-of-uk-syrian-refugees-resettlement (Accessed: 27 May 2016). Guardian. (2012) Providing the right support for young asylum seekers. Available at: https://www.theguardian.com/social-care-network/social-life-blog/2012/may/18/providing-support-young-asylum-seekers (Accessed: 02 July 2016). Gupta, J. & Sullivan, C. (2013) 'The central role of occupation in the doing, being and belonging of immigrant women', Journal of Occupational Science, 20 (1), pp.23-35. Henry, A.D. (2000) Pediatric interest profiles: surveys of play for children and adolescents, kid play profile, preteen play profile, adolescent leisure interest profile. Psychological Corporation, a Harcourt Assessment Company. Horghagen, S. & Josephsson, S. (2010) 'Theatre as liberation, collaboration and relationship for asylum seekers', Journal of Occupational Science, 17 (3), pp.168-176. Huot, S., Chen, X., King, C., Painter-Zykmund, E. & Watt, K. (2016) 'Making difficult decisions: Immigrants’ experiences of employment preparation and participation', Work, (Preprint), pp.1-12. Lie, B. (2002) 'A 3-year follow-up study of psychosocial functioning and general symptoms in settled refugees', Acta Psychiatrica Scandinavica, 106 (6), pp.415-425. Lipson, J.G. (1993) 'Afghan refugees in California: mental health issues', Issues in Mental Health Nursing, 14 (4), pp.411-423. Maroney, P., Potter, M. & Thacore, V.R. (2014) 'Experiences in occupational therapy with Afghan clients in Australia', Australian Occupational Therapy Journal, 61 (1), pp.13-19. Molineux, M. & Baptiste, S. (2011) 'Emerging occupational therapy practice: Building on the foundations and seizing the opportunities', Role Emerging Occupational Therapy: Maximising Occupation-Focused Practice, pp.3-14. Red Cross. (2016) Support for Young Refugees. Available at: http://www.redcross.org.uk/What-we-do/Refugee-support/Support-for-young-refugees (Accessed: 01 August 2016). Refugee Action. (2015) Annual Report 2014-2015. Available at: http://www.refugee-action.org.uk/assets/0001/4406/refugeeactionaudited_accounts2015.pdf (Accessed: 06 July 2016). Refugee Council. (2016) prime minister announces uk to accept 20 000 refugees from syria. Available at: http://www.refugeecouncil.org.uk/latest/news/4422_prime_minister_announces_uk_to_accept_20_000_refugees_from_syria (Accessed: 01 August 2016). Rousseau, C. & Guzder, J. (2008) 'School-based prevention programs for refugee children', Child and Adolescent Psychiatric Clinics of North America, 17 (3), pp.533-549. Scottish Adoption. (2016) Occupational Therapy. Available at: http://www.scottishadoption.org/therapy-centre/occupational-therapy (Accessed: 01 August 2016). Scottish Government. (2016) Furthering Children's Rights. Available at: https://beta.gov.scot/news/furthering-childrens-rights/ (Accessed: 01 July 2016). Scottish Government. (2016) Refugee and Asylum Seekers - Funding. Available at: https://beta.gov.scot/policies/refugees-and-asylum-seekers/funding/ (Accessed: 01 August 2016). Scottish Government. (2016) Refugee Task Force. Available at: https://beta.gov.scot/groups/refugee-task-force/ (Accessed: 01 July 2016). Scottish Government. (2016) Support for Unaccompanied Refugee Children. Available at: https://beta.gov.scot/news/support-for-unaccompanied-refugee-children/ (Accessed: 01 August 2016). Scottish Government. (2016) Working with Partners. Available at: https://beta.gov.scot/policies/refugees-and-asylum-seekers/working-with-partners/ (Accessed: 01 July 2016). Scottish Government. (2015) Scotland's Response to Refugee Crisis. Available at: https://beta.gov.scot/news/scotlands-response-to-refugee-crisis/ (Accessed: 01 August 2016). Simich, L., Beiser, M., Stewart, M. & Mwakarimba, E. (2005) 'Providing social support for immigrants and refugees in Canada: Challenges and directions', Journal of Immigrant and Minority Health, 7 (4), pp.259-268. Simich, L., Beiser, M. & Mawani, F.N. (2003) 'Social support and the significance of shared experience in refugee migration and resettlement', Western Journal of Nursing Research, 25 (7), pp.872-891. Smith, Y.J., Stephenson, S. & Gibson-Satterthwaite, M. (2013) 'The meaning and value of traditional occupational practice: a Karen woman's story of weaving in the United States', Work (Reading, Mass. ), 45 (1), pp.25-30. Strijk, P.J., van Meijel, B. & Gamel, C.J. (2011) 'Health and social needs of traumatized refugees and asylum seekers: An exploratory study', Perspectives in Psychiatric Care, 47 (1), pp.48-55. The Children's Society. (2015) Briefing on Young Refugees Available at: http://www.childrenssociety.org.uk/sites/default/files/tcs/research_docs/Briefing%20on%20Young%20Refugees.pdf (Accessed: 04 July 2016). The Children's Society. (2015) Young Refugees. Available at: http://www.childrenssociety.org.uk/what-we-do/helping-children/our-programmes/young-refugees (Accessed: 01 July 2016). UK Government. (2016) Asylum Statistics. Available at: https://www.gov.uk/government/publications/immigration-statistics-october-to-december-2015/asylum (Accessed: 01 July 2016). UK Government. (2016) New scheme launched to resettle children at risk. Available at: https://www.gov.uk/government/news/new-scheme-launched-to-resettle-children-at-risk (Accessed: 29 April 2016). UK Government. (2013) Devolution settlement: Scotland. Available at: https://www.gov.uk/guidance/devolution-settlement-scotland (Accessed: 01 August 2016). UK Government. (1999) Immigration and Asylum Act 1999. Available at: http://www.legislation.gov.uk/ukpga/1999/33/part/VI (Accessed: 01 August 2016). UK Government. (1998) Scotland Act 1998. Available at: http://www.legislation.gov.uk/ukpga/1998/46/schedule/5 (Accessed: 01 August 2016). Whiteford, G. (2000) 'Occupational deprivation: Global challenge in the new millennium', The British Journal of Occupational Therapy, 63 (5), pp.200-204. Whiteford, G.E. (2005) 'Understanding the occupational deprivation of refugees: a case study from Kosovo', Canadian Journal of Occupational Therapy.Revue Canadienne d'Ergotherapie, 72 (2), pp.78-88. Wilcock, A.A. (2006) An occupational perspective of health. Slack Incorporated. World Federation of Occupational Therapists. (2015) World Occupational Therapy Day 2015. Available at: http://www.wfot.org/Portals/0/PDF/2015/World%20Occupational%20Therapy%20Day%202015%20Celebrations%20update.pdf (Accessed: 01 August 2016). World Federation of Occupational Therapists. (2014) Position statement. Human displacement. Available at: http://www.wfot.org/ResourceCentre.aspx (Accessed: 01 July 2016). World Health Organisation. (2016) Supporting people with severe mental disorders in war and other disaster settings: A need to protect the most vulnerable. Available at: http://www.who.int/mediacentre/commentaries/mental-disorders-in-war/en/ (Accessed: 1 July 2016).